There are two types of electrical signals, AC (alternating current) and DC (Direct Current). As AMPLFY's portable speakers are powered by batteries, we will only be dealing with DC electricity signals. Direct current means that electricity flows in one direction between the power (+) and the ground (-) within a circuit. A circuit is a complete and closed path through which electric current can flow between the power and the ground. All circuits require that electricity is used. For example, in the photo above the energy is being used by the LED light. In other words, there needs to be something wired between the positive and the ground that adds resistance to the flow of electricity and uses it up. 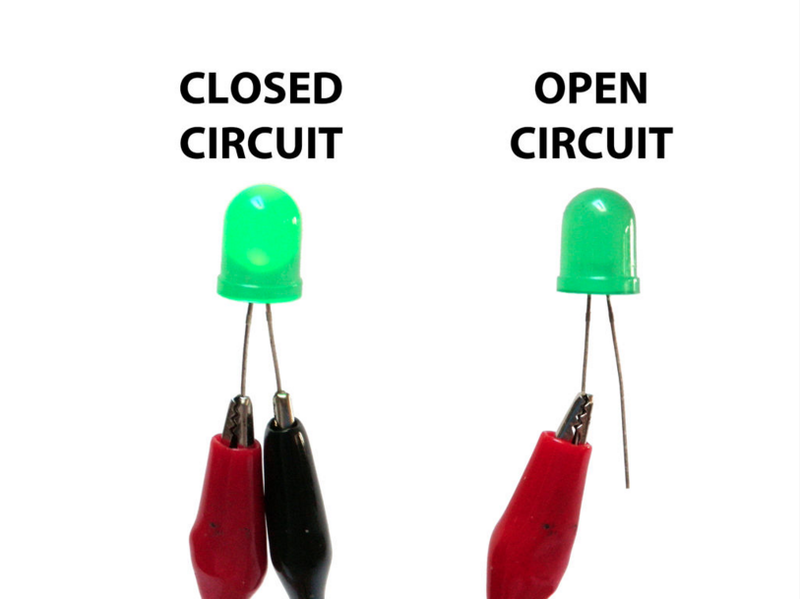 If positive voltage is connected directly to the ground and does not first pass through something that adds resistance (like an LED or an Amplifier), this will result in a short circuit. This means that the positive voltage is connected directly to the ground. Short circuits are bad because they will result in the battery and/or circuit overheating, breaking , catching on fire, and/or exploding. Note: It is very important to prevent short circuits by making sure the positive wire is not connected directly to the ground wire. Electricity is typically defined as having a voltage and a current. For example, the battery packs used in AMPLFY's portable speakers are rated at 11.1 Volts (nominal) and have a current of about 9,000mA (9,000 milliamps). Each battery pack consists of 12 Lithium-Ion batteries and each battery has a minimum voltage of 2.5 volts and a maximum of 4.2 volts (3.7 volts nominal). To create a battery pack with a voltage of 11.1 volts, using a 3.7 volt batteries, the battery pack must be wired in series. When wired in series, electricity flows through one thing, and then the next thing, and so on. This means that the voltage of each battery wired in series is 'added' onto the next battery. Therefore to create 11.1 volts, 3 batteries (battery packs) must be wired in series (3.7 volts X 3 = 11.1 Volts). The job of an audio system is to replicate the sound created during the recording process. Sound is a pressure wave, and like any wave it is introduced into the medium by a vibrating object (for example a voice box, or the strings of a guitar). There are two main properties of a wave, frequency and amplitude. Regardless of what created the sound, the particles of the medium which created that sound are vibrating back and forth at a given frequency. The frequency of a wave is measured as the amount of vibrations during a given period, whereas the amplitude refers to the size of the wave. Amplitude is important when it comes to balancing and controlling the loudness of sounds. It is also the origin of the word amplifier, a device which increases amplitude of a wave form. During the recording process, when sound reaches the diaphragm of a microphone, it causes the diaphragm to vibrate (or move) back and forth at a given frequency. This creates an electrical signal that is analogous to the wave in air - the signal created is very small (on the level of millivolts). Note: One of the earliest analog recordings was on a piece of wax. The signal would cause the needle to move, which would etch a pattern onto a spinning cylinder of soft wax. To play it back, the same cylinder would spin and another needle would follow the etched groove, which would generate an electrical signal again, playing the recorded signal back. The role of an audio system is to replicate the frequencies created during the recording process and to amplify the signal so that it can be heard at the desired level. There are three critical components to any audio system. The first is the audio signal, the second is the amplifier (with a power source) and the third is the speaker drivers. The audio signal (created during the recording process) is translated by the amplifier which boosts the signal and sends it to the speaker drivers to replicate the frequency at the desired amplitude. In order for the amplifier to boost the audio signal, it must first draw energy from a power source. The picture below demonstrates each critical component. As you can see, the amplifier is receiving an audio signal from the iPhone via an Aux Cable. The audio signal is comprised of both a 'left' and a 'right' audio signal, which is travelling through separate wires inside the Aux cable. The amplifier uses the charge from the battery to 'boost' the audio signals (increase the amplitude of the waveforms) and replicate the frequencies at a amplified output via the speaker drivers. This photo shows the critical components of every audio system. The amplifier is receiving the audio signal from the iPhone. The amplifier 'boosts' the signal via the energy provided by the battery and sends the signal to the speakers.